My curiosity was sparked. I couldn't wait to ask my Dad about it, since he frequents French Lick for many reasons....not just for the wine or casino! What I got was a history lesson that took me back to through the 1900s and ended with a tour of the most majestic hotel I have ever set foot in. 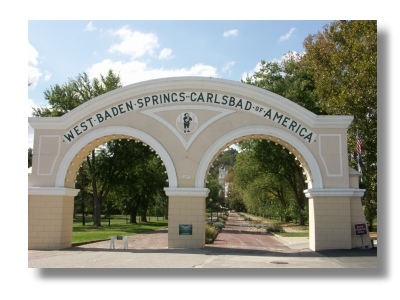 West Baden earned its fame from its mineral springs. 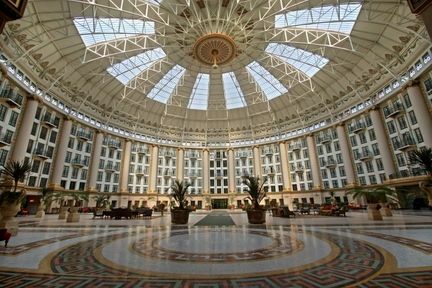 Since the only thing that separates West Baden and French Lick is a boundary line, the two towns share many historical similarities and are locally referred to as "Spring Valley." 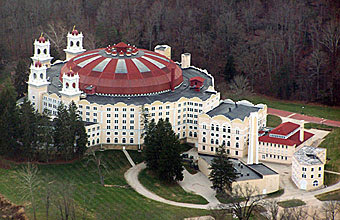 The towns were build around lavish resort hotels and in West Baden it was the West Baden Springs Hotel, now referred to as the West Baden Springs National Historic Landmark. 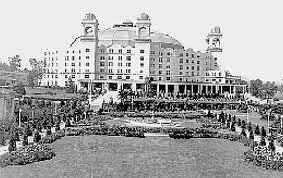 It took architect Harrison Albright only 277 days in 1902 to complete the current West Baden Springs Hotel for owner Lee Wiley Sinclair. The structure features a 200 foot domed atrium, the largest free-span dome in the world until the Houston Astrodome was built in 1968. Until the stock market crash and the Great Depression, the town of West Baden had earned from travelers the nickname of "The Monte Carlo of America." While it was the West Baden Springs Hotel that brought the rich and famous..even the infamous gangster Al Capone...to the area, there were other prominent business men who left their marks on West Baden. Before it made its way to French Lick, West Baden was the first stop in the area for the Monon Line. Wealthy travelers from cities like Chicago, Indianapolis, Cincinnati, and routinely made their way to West Baden via the Monon and B&O railroad lines. Driving under the sign on the brick laid road is the beginning of being transported back in time. I felt as though I was entering The Great Gatsby. The dome is larger than the St. Peters Basilica and the Pantheon. It includes a walk in fireplace with pictures of the Greek Gods of Wine....beautifully sculpted. The middle of the dome...so high!